Every 2nd and 4th Thursday at 7:00 pm join us for our Women's Bible Study! Hello! Welcome to Solid Rock! Located in Mt. Dora, Florida, Solid Rock Worship Center is a cross-denominational church, focused on impacting the world for Christ in our generation! We're a Bible-Based church, with a passion for world missions, exploring God's Word and applying it's unchanging truth to our lives everyday. We're community oriented and strive to create a caring atmosphere that exemplifies the love of Christ. It's our hope that everyone who attends our services will encounter the life changing, love and grace found in Jesus Christ, while getting the opportunity to build relationships that will strengthen your life, faith and family! We encourage you to open your heart to the thoughts and plans that God has for your life ... Thank you for visiting us! 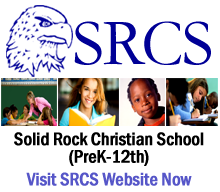 Solid Rock Worship Center, Inc.